The PROBOX2 Z might be cheap price wise, but it does exactly what it needs to do. 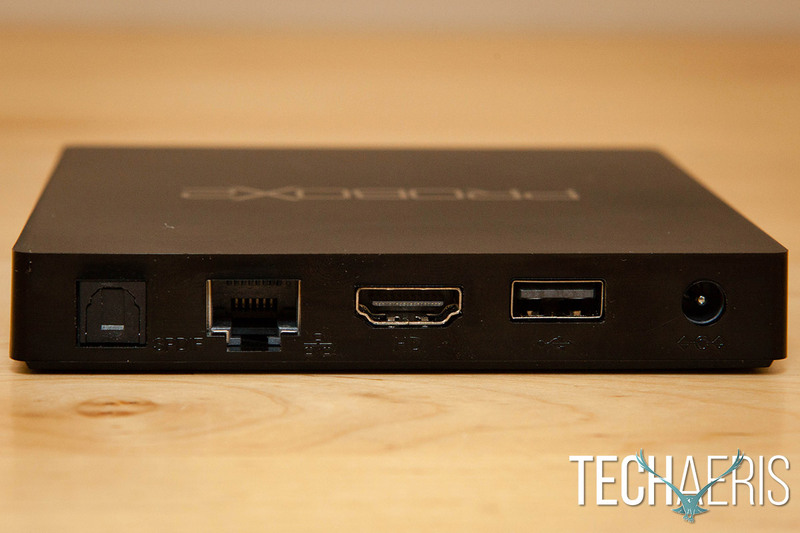 We recently reviewed the PROBOX2 EX+ streaming media box, and even gave one away with the smaller PROBOX2 Z a few weeks ago. 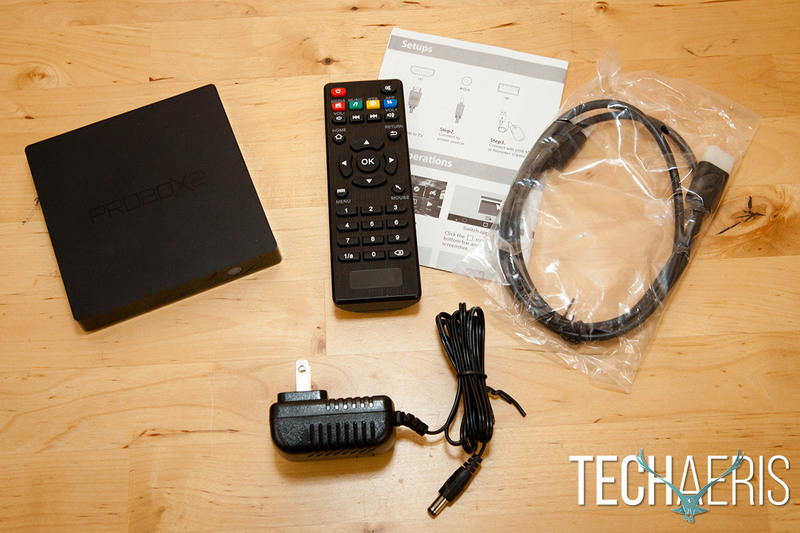 It’s time for another review and our PROBOX2 Z review takes a look at the slightly smaller and much cheaper version of the PROBOX2 streaming media device family. A few components will be very similar, so this will be a shorter review so make sure you read the PROBOX2 EX+ review if you need to fill in the gaps. PROBOX 2 recommends that if you’re after higher performance like gaming and 4k playback then the EX+ is the route you should go, otherwise if you only want streaming purpose and few apps installation then Z is another good choice. You get pretty much everything you need with the PROBOX2 Z. Like the PROBOX2 EX+, the PROBOX2 Z features a pretty simple design. It’s a simple black square, just under 18mm in height and pretty non-descript. The PROBOX2 logo is embossed on the top of the unit. The back of the box houses your SPDIF (optical audio) out, Ethernet, HDMI, USB, and power ports, while the right side houses a second USB port and a microSD card slot. The front of the unit has a clear circle which glows red when the unit is powered off and blue when it is on. Like the PROBOX2 EX+, the included remote is pretty standard and includes power, mute, media, music, web, app, skip, home, return, menu, mouse cursor, and number buttons as well as a navigation wheel and OK button. You’ll probably want to pick up the Remote+ for an extra $20USD as it makes it much easier to control and navigate the device. The PROBOX2 Z really is simple to use. Simply plug in an Ethernet cable if you are going to be using it with a wired connection. Connect the HDMI and SPDIF cable as required, and finally plug it in. Once you’ve booted up for the first time head over to the More tab on the main screen and hit the settings option to set your network, date & time, language, and more. Once you have an internet connection set up, launch the media player to access Kodi. In this case it’s Kodi Isengard. The only thing I had to do was to install Exodus as it didn’t come pre-installed and I was good to go. The interface on the PROBOX2 EX+ is nice and clean, and is a nice overlay on the Android 5.1 operating system. 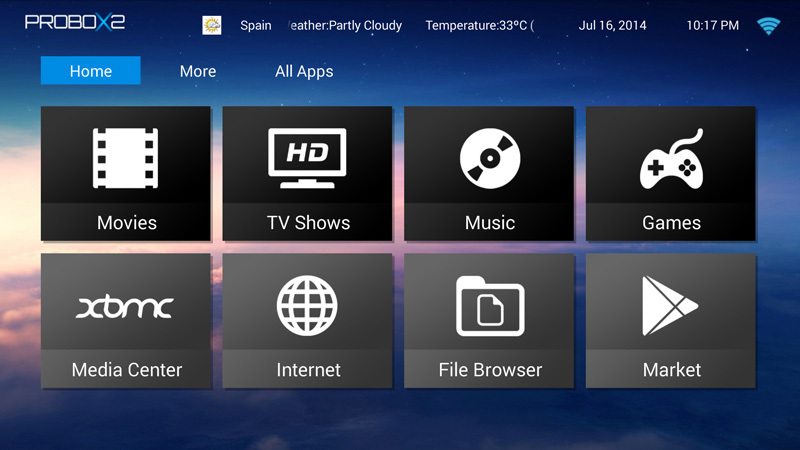 The Home menu has large tiles for Movies, TV Shows, Music, Games, Media Center (Kodi 15.2 Isengard), Internet, File Browser, and the Google Play Store (labelled as Market in the app). The first four are basically shortcuts to apps that you can set for each category. There is also a More tab which include favorites, photos, streaming, social, a task killer, and settings options. Finally, there is an All Apps tab which allows you to access all the installed apps on the system. The top of the interface displays your location, temperature, date, time, and Wi-Fi signal depending on what you’ve set up. The PROBOX2 interface is simple and easy to navigate. Kodi is the streaming media player of choice, and it came pretty much ready to go. As I previously mentioned, the only thing I had to do was install Exodus and I was good to go. Movies and TV shows streamed as expected from Exodus, and local and network storage streaming worked great as well. Google Play music streaming and Netflix performed as expected, both with no issues. I initially began by streaming over Wi-Fi and found that streaming through Kodi over Wi-Fi on the PROBOX2 Z tended to buffer a lot. After I connected it to a wired connection, it was fast enough to keep up with the video and there was no stuttering during my use of the box. 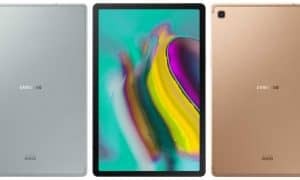 It was an interesting issue as the PROBOX2 EX+ works fine over Wi-Fi on the same network, but the EX+ supports ac, while the Z only supports n so that could be part of the problem. 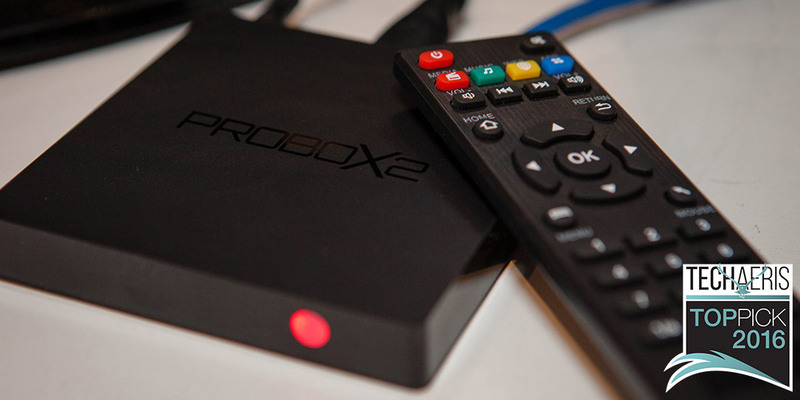 Currently priced at $39.99USD ($49.99CAD), the PROBOX2 Z is definitely a steal and a very affordable way to get into media streaming and potentially cutting the proverbial cable cord. If you’ve been looking for a media streaming device the PROBOX2 Z offers great performance, an easy setup, and clean interface at a very affordable price. For those reasons, the PROBOX2 Z joins its sibling as one of Techaeris’ Top Picks of 2016. If you've been looking for a media streaming device the PROBOX2 Z offers great performance, an easy setup, clean interface at a very affordable price. 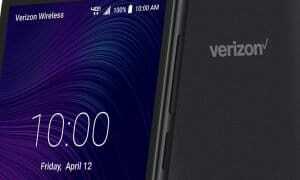 *We were sent a review sample of the PROBOX 2 Z for the purposes of this review.